First measure and cut out your pieces. My pillow was 18x12, so I added a half inch on each side for seam allowance. So I cut two pieces 19x13 and bought a 18 inch zipper. Sewing the zipper is the trickiest part of this whole pillow. It's actually the only semi-difficult part. With the fabric right side up, place the zipper right side down and line up the right sides of both. Pin down with a few pins to keep in place. Change feet to a zipper foot. Sew zipper on, using your zipper foot as a guide. You're half way there! 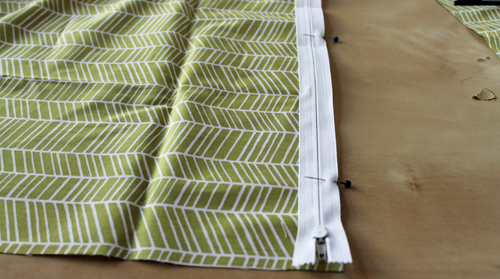 Placing right sides together, line the zipper with the under fabric on the right. Pin in place and sew just like on the other side. Congrats you have successfully sewn a zipper! Now, just line up the pieces of fabric and pin in place. Beginning with a zipper side, sew with a half inch sew allowance along the side, when you get to a corner, put needle in, lift presser foot, and turn the fabric. Sew all the way around! Turn inside out, and ta-da! A pillow cover is born!